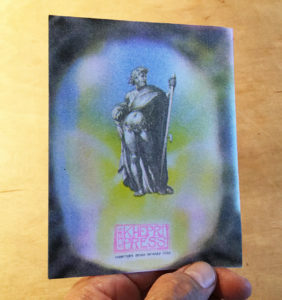 These ‘zines were produced for a lecture series for Morbid Anatomy Museum and Library. The Homunculus (Latin: little man). 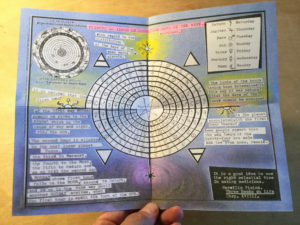 An artificial, created “rational animal,” or human being that, according to Paracelsus, “has all the limbs and features of a child born of woman, except much smaller.” This ‘zine is a collection of excerpts from a range of texts and images, from Aristotle to the 17th century, dealing with the generation of life both natural and artificial. Included are translations from The Book of the Cow, and Jabir ibn Hayyan’s Book of the Concentration. 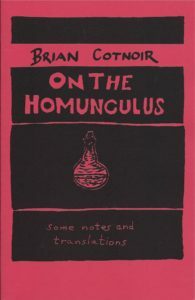 This small work is more or less a little reader on the homunculus. 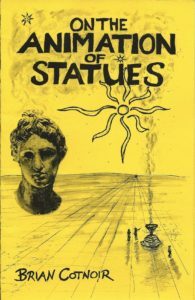 Is a collection of quotes, primary sources, notes and comments on the late-antiquity practice of “ensouling” statues in order to commune with the gods. Drawing from Iamblichus, Proclus, Greek Magical Papyri, Corpus Hermeticum, hymns, poetry and music, although the practice is never explicitly described, a hazy outline emerges. 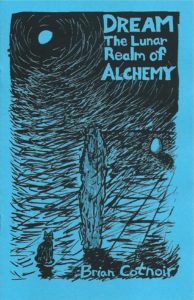 One thing, the composition of statues and talismans is, like alchemy, a hieratic art. 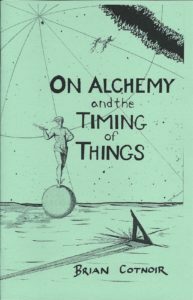 This zine is a meditation on time and its relation to alchemy and by extension any creative act. 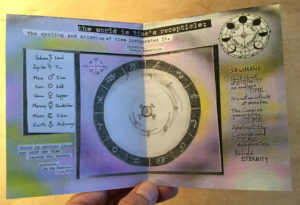 Through a collection of primary sources, quotes, etc, Kronos (linear chronological time) and Kairos (the “now” that opens onto eternity) are explored in light of practice. 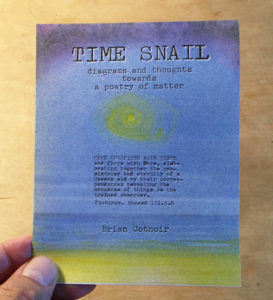 Several timing systems are presented and included is a centerfold Lord of the Hours Time Snail. A very useful tool for determining planetary hours. A golem is a man of clay brought to life through the power of the word – the written word. Of all the legends and stories of golems, perhaps the most famous is the story of Rabbi Loew and the Golem of Prague. Rabbi Loew, as the story goes, in the 16thcentury during the reign of Rudolph II, in Prague using secret practices from the kabbalah, brought to life a clay man to defend against anti-Semitic attacks. This story has resonated for generations and has been retold many times in a variety of media. What truths are there in this story, how did this Golem come to be? 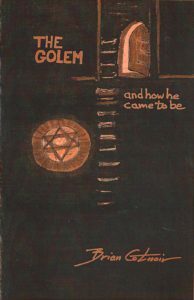 This zine looks into the mystical practices of Judaism that are at the heart of the legends and examines how this story evolved over time and was re-told in a variety of media, such as Paul Wegener’s silent film Der Golem, the play The Golem by Leivick and Julien Duvivier’s 1936 Le Golemfilmed in Prague and in the Altneu synagogue. Included in the zine are some of the earliest legends and stories of the golem. Most notably, translated here for the first time, is Franz Klutschak’s 1841 Der Golam Des Rabbi Löw, one of the earliest versions of the Rabbi Loew and Golem story. 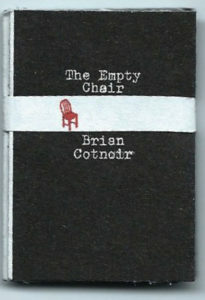 The Empty Chair is a visual guide to a thought experiment, or a meditation, however you wish to think of it, on how to open up an object and explore its borders and its creation. 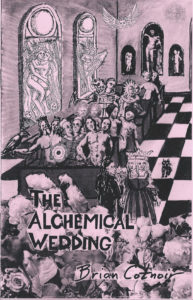 It is an alchemical dissolution where creation and change may take place. 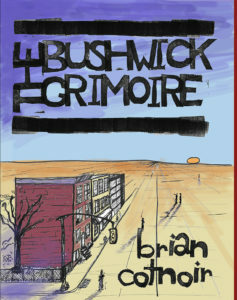 The Bushwick Grimoire is a response to stories I have heard over the years of folks “working” with grimoires and other magickal texts and then finding “things” that won’t go away. It is a tongue-in-cheek commentary.